Frizzel Gerald Gray was born on this day in Tuner Station, Dundalk just outside of Baltimore, Maryland in 1948. He is 64 years old. He is the oldest of four siblings. His father left the family when Gray was a 11 and his mother, Mary Elizabeth Gray, raised the children as best she could as a single mother. She died of cancer when he was 16. He began to hang out on the corner drinking with friends to blow off steam. He admits to hanging with the wrong crowd. He could feel his life spiraling out of control as he was arrested on suspicion of theft “Because” he said in a U.S. News and World Report interview ” I happened to be black and happened to be young.” And soon found himself the teenaged parent of five children. But on a July night in the late 60s all that changed. He felt something come over him and he stepped away from the corner and toward the future. He spent “the rest of the night in prayer, then proceeded to earn his high-school diploma and pursue a college degree.” [IBID] He changed his name to Kweisi Mfume, a phrase that means “conquering son of kings” in Ghana. He began to work in radio, first as a volunteer than as an announcer. 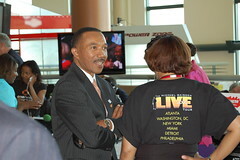 When his college, Morgan State University opened its own radio station Mfume became the program director. He parlayed his popularity on the Radio and in Baltimore’s African-American community into politics in 1978 when he ran for Baltimore City Council. There he became a vocal critic of Mayor William Donald Schaefer whom he accused of ignoring poor neighborhoods. Eventually Mfume learned the three-pronged art of negotiation, compromise and coalition building. In 1986 he ran for U.S. House of Representatives and won a seat in Congress. He worked on the House Committee on Banking, Finance and Urban Affairs and later on farming and zoning issues. He maintained a strong tie to Baltimore City and the residents that lived in the inner city. In 1996 Mfume left Congress and became the president of the NAACP (the National Association for the Advancement of Colored People. 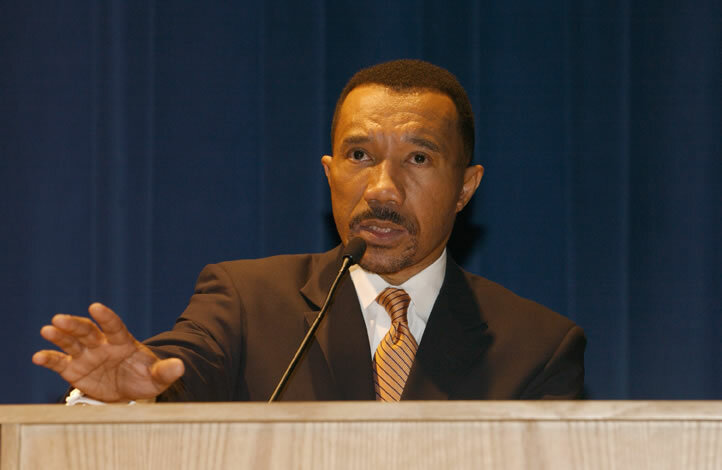 He successfully managed the organization’s financial issues and illuminated the NAACP’s $4.5 million debt. He worked to address “affordable health care, conservation, voting reform, and hate crimes.” [IBID.] He helped raise over $90 million and created the NAACP’s National Corporate Diversity Project during his tenure at the organization. 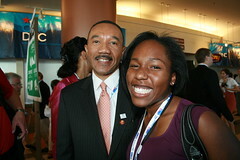 His term at the NAACP ended on January 1, 2005. This entry was posted on Wednesday, October 24th, 2012 at 4:13 pm	and tagged with Baltimore, Kweisi Mfume, NAACP and posted in American History, Baltimore, Kweisi Mfume, Maryland, postaday, Thought of the Day, Today's Birthday, United States. You can follow any responses to this entry through the RSS 2.0 feed.